Congratulations to Ashley R. of New York on the purchase of Georgia. You got a special one, Ashley! PREMIUM FILLY AND SITE CHAMPION FILLY! 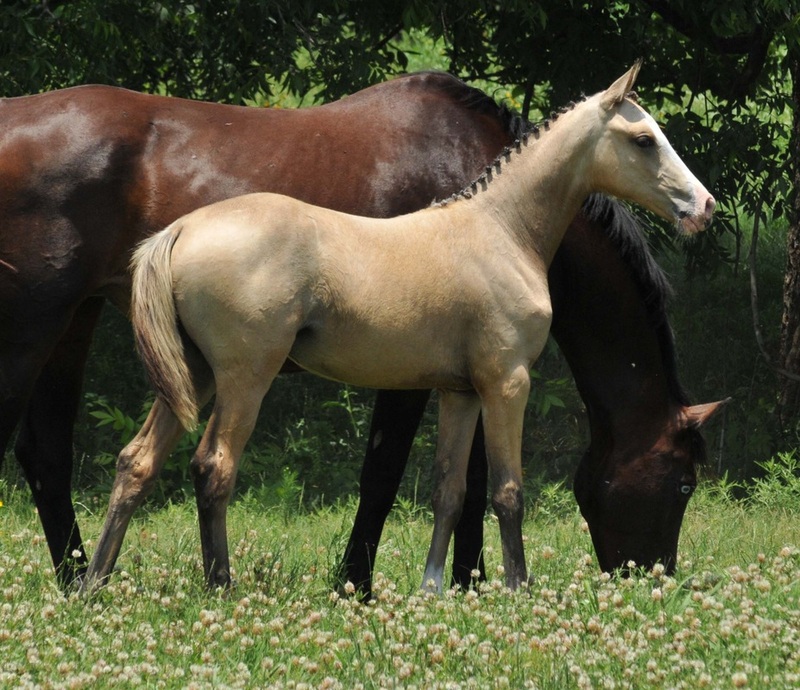 This 2013 buckskin filly is simply spectacular and a serious top level prospect. She is by Goldmaker and out of Macy's Rainbow. Macy's Rainbow is a full sister to the Grand Prix Dressage mare, Maude RF. Macy's sire, Mannhattan competed to Level 8 in the jumpers before a career ending injury. Mannhattan has proven himself to produce upper level performance horses with incredible, user friendly brains. Macy is no exception to that. Georgia's sire is the only North American based cremello TB stallion to have successfully completed a stallion performance test amongst some of the top bred warmblood stallions in the country - and he did it at the age of twelve! Goldmaker is proving himself to produce offspring that will be competitive in dressage, eventing, jumping and the hunters. Good minds, conformationally correct, athletic and all in that lovely gold palomino or buckskin packaging! Georgia has an easy going, user friendly temperament and loves interacting with people. She leads, loads, stands for the farrier, clips and is UTD on farrier work and de-worming. This filly will be an outstanding athlete that has the added bonus of being beautiful, as well.